About 100 years ago, a winged monster frequently roamed the Grand Valley region. The flying terror seemed to sniff out farmers who were living happily off the land, growing apple and pear orchards. It would swoop in and wipe out once-flourishing crops in what felt like no time. The apples and pears were feasted upon like a free fruit buffet: very few made it out in one ripe, wholesome piece. 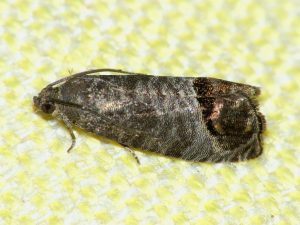 The Codling Moth was a major pest to the Mesa County fruit industry in the early 1900s. Their larvae did not feed upon leaves; they loved to bore deep into fruit, causing it to become rotted and wormy. The adult moths would lay their eggs on the fruit, allowing the Codling Moth to live out various life cycles from egg to adult on their chosen host plant. All was going seemingly well until farmers began to notice their apple and pear trees wilting, surrounded by rotting fruit littering the ground below. The Codling Moth was soon discovered as the nasty culprit behind the death of many farmers’ orchards. Attempting to mitigate the situation, dangerous combinations of chemicals were sprayed upon the crops. The fruit then had to be power washed to remove chemicals that are severally dangerous to the human body, such as combinations of lead and arsenate. The time and money spent attempting to kill off these pests became unbearable, even more so when the Codling Moth built a tolerance to the sprays, determinedly thriving on to kill again. “The codling moth was the enemy of the apple and pear business. They didn’t have chemicals, agricultural chemicals to control it, in the sense that we understand it today. The last crop of apples that I raised on this place here was in 1935 and I sprayed those apples 11 times with arsenate of lead, Grandpa’s soap and kerosene and they just looked like they’d been painted. They were clean but the sanitation….you couldn’t get it off. In those days, they had a program and it wasn’t the arsenic that was detrimental to the human, it was the lead. It built up in your body and there was no disposition of it for your body and it remained there. So you had to get a sanitary certificate that these apples met a certain criteria before you were permitted to sell them. These apples wouldn’t meet that criteria that fall after I’d had them washed…put them through what they called a washing machine.” – Oscar Winfield James Jr.
Joyce Sexton’s previously mentioned article informs us that as a result of the Codling Moth, as well as other pests and problems, more than half a million fruit trees were pulled up and destroyed. The resurgence of the Grand Valley fruit industry was partially spurred with the creation of newer and less dangerous chemicals to mitigate pests. Farmers also began to take more care and caution while deciding which varieties of fruit trees were planted; they started planting fewer varieties but in larger quantities. The peaches in Mesa County are some of the best in the world (yes I’m biased), and we have the hard work and resilience of farmers from our past and present to thank. 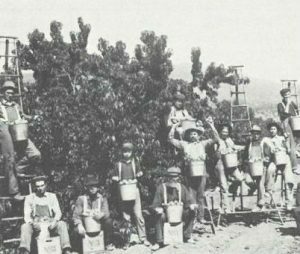 If you are interested in more historical information on early fruit farming practices, visit the Mesa County Oral History Project. Also, if you’d like to gain knowledge about gardening and growing practices, check out Mesa County Libraries’ Discovery Garden! The Discovery Garden is a new library project created to provide education, food, respite, and community engagement. A variety of gardening techniques will be modeled including xeric, raised bed, in-ground farming, pollinator, and permaculture design. For volunteer opportunities and interactive programs visit our website. Posted in General, Local History, Programs/Classes. Great article, Michele! I had never heard of the Codling Moth before. So fascinating.